Since the day first PVC (Polyvinyl Chloride Conveyor) has proven its potential in the different segments among the automation system is one of. Conveyor belts made of the PVC material have magnified the production efficiency of the thousands of industries and decreased the downtime of the same. However, amid the increased competition, it is hard to find the reliable PVC conveyor belt manufacturer who can be the truly worthy for your belt requirements. We are India’s top manufacturer of the PVC conveyor belt, having 20+ experience in the rubber conveyor belt manufacturing, have manufactured the exhaustive range of the PVC conveyor belt leveraging the virtuosity obtained from the experience, which shares all the irresistible attributes that definitely going to entice you to invest in. The thoroughly tested Polyvinyl Chloride (PVC) material and leading edge technology are the strong points of our PVC conveyor belt, which has made our polyvinyl chloride conveyor belt a truly reliable and cost effective alternative to accomplish variegated conveying jobs. This PVC conveyor belt is available in the exhaustive series, which each is manufactured in compliance to the international quality standards and also the FDA standards of food safety and hygiene and hence it is a perfect bet for industrial use and the food contact one. Whether you require flat PVC belt or the Chevron, Diamond top, Rough Top, Sawtooth, Lozenge Pattern, Raised Rib, Dot Pattern, we embrace exhaustive series of the PVC conveyor belt to fulfill your requirements at the farthest. Other than, we are enriched with the technology & experience, enabling us to manufacture custom made PVC belt of the different thickness, strength and cover style and also apply cleats, guides, corrugated sidewalls to almost every type of belts and as per end user requirements and for the same we are well acknowledged in market as the best solution provider for the conveying needs. Our PVC conveyor belts have demonstrated their potential in all types of light, medium and heavy duty applications, among food, pharma, confectionary, food packaging, tiles, marble, brick, tiles, tobacco, chemical, clothing, metal working and mining are few of them, if you are also looking for the PLC conveyor belt, but not able to determine right one for your need, our technical team is available to counsel you the best suited conveyor belt at the free of cost..! The PVC material used in the manufacturing of the conveyor belt is non toxic and also has declared to be safe and healthy material by FDA bodies, making our PVC conveyor belt safe for industrial application as well as food. The nonporous surface of the PVC conveyor belt prevents accumulation of the bacteria, entitles easy cleaning and hence ensures high level of the hygiene. 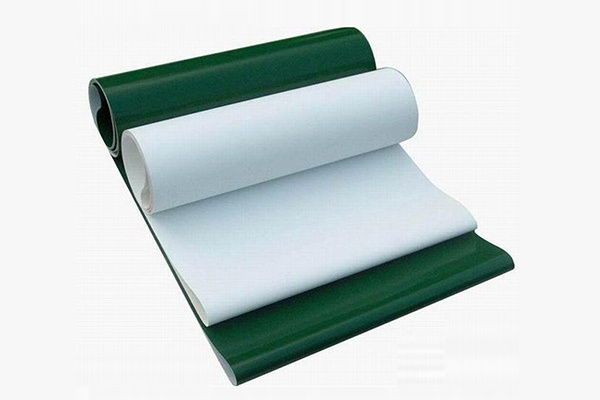 The low cost of the PVC material and efficient manufacturing facilities enable us to bring forth the range of the PVC conveyor belt at the cost that is lower than the competitors and also other type of belts. The offered PVC conveyor belt is capable of handling light duty, medium duty and heavy duty load effectively, and hence by means of one can convey any type of material with an ease. Our PVC conveyor belt is lighter than the metal and stainless conveyor belts, thanks to the lightweight aspect of the PVC material and hence is easy to handle and install. Even though it is a rubber material, the high chlorine content of the PVC prevents ignition and ensures fire safety, which makes our PVC conveyor fire resistance too. The unmatched attributes of the PVC material, including resistant to chemicals, corrosion, abrasion, high temperature, shock imparts significant withstand capability to our PVC conveyor belt, even under the harshest condition and hence ensure longer service life.